We've all heard common advice for eluding the swine flu such as getting the vaccine and washing your hands a zillion times a day but now I'm going to share my secret tips with you in the hope that you remain well and happy. * 1. Buy yourself some fun-size chocolate bars. It's Halloween and they're everywhere. Chocolate makes many, many people happy. You want to keep your immune system super happy during flu season, don't you? Sure you do. I recommend a 12 pack of Crispy Crunch (go on, they're tiny) but whatever the twelve pack of your choice is will work just as well. 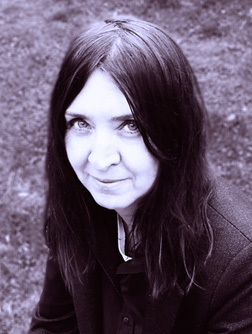 * 2. From now until when the swine flu epidemic is over, only hang out with superheroes. With their superhuman immune systems you won't have to worry about them passing on germs to you. Unfortunately, this option didn't work out so well for me as one of the superheroes I was hanging out with was The Torch and there's now been some fire damage to my apartment. The Hulk was here at the time and got angry on my behalf and inadvertently destroyed my bathroom. Thank God Wonder Woman and Batman dropped by and helped get things back under control! But I have to say, it was annoying the way Batman kept staring out my window, searching the sky. I mean, hello, are we hanging out or do you have something better to do? Make up your mind, why don't you! Anyway, just be cautious about which superheroes you choose to spend your time with. * 3. Get yourself down to your local Blockbuster Video while their current 30% off sale is on and treat yourself to a previously used copy of Wii game Escape From Bug island for a grand total of $6.88 (price may vary according to your regional taxes). 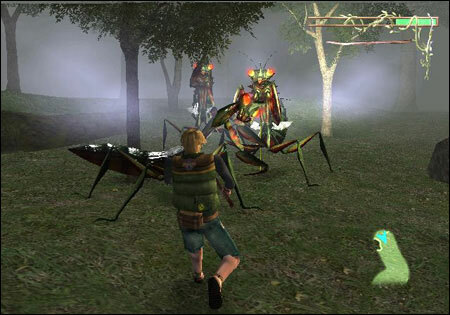 Yes, it's a very early Wii game and kind of wooden and cheesy but you get to battle giant praying mantises, moths etc. Adrenaline, baby, it's good for you. What more could you want for $6.88? * 4. Buy yourself a Tim Hortons donut. This tip works similarly to #1. I know it can be difficult to force yourself to eat a donut— especially if it's something like Boston Cream, chocolate glazed or kiwi lime but exercise some self-discipline—remember, this is your health we're talking about! * 5. Watch The Trailer Park Boys: Countdown to Liquor Day. For the endorphins, which recent studies show enhance the immune system, relieve pain, reduce stress and increase well-being. It's impossible to watch this movie with a straight face—from Randy's markered head to the boys' home made security office uniforms when they try to rob a bank, the final TPB offering is a laugh riot. For increased flu-fighting potential eat a donut or several fun-size chocolate bars during your viewing. * 6. Build/purchase a robot to pick things (which may be contaminated with flu germs) up for you, open doors (which may be contaminated with flu germs) and shake hands (which may be contaminated with flu germs) on your behalf. This is the twenty-first century and where are the flying cars already? But if we can't have the soaring cars, at least let's get going with the robots. If you're not very good with technical matters yourself, and are therefore unable to construct your own robot, contact your local community college and get one of the tech students to whip you up one on the cheap, right now before they graduate and their robot design prices go through the roof. Be sure not to buy a Terminator, though, particularly if you happen to be John Connor or someone close to him. *7. 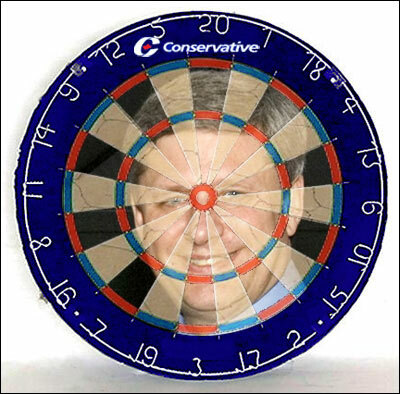 Customize your dart board by covering it with Prime Minister Stephen Harper's face. The space between his eyes should serve as the bull's eye, of course. Again for the endorphins. We really want to keep that immune system bolstered! * 8. Go trick or treating this Halloween, no matter your age. When you've been around for decades, like I have, you might not think you can go trick of treating any more. Won't the neighbours shun you or maybe even call the cops? No, see they won't have any clue it's you! Just get yourself some kind of goofy face mask. Kids are tall these days, I figure as long as you're not over six foot three, you're good to go. 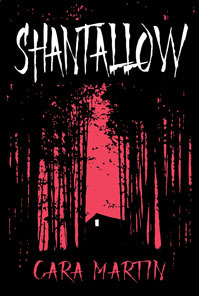 If you're taller than that, I do recommend you hunch over (maybe wear a costume that supports a hunched over personna). The money you spend on your costume will pay itself back in candy later in the evening and you can find out which of your neighbours give out the really good stuff and write yourself a reminder to drop by their house again next Halloween. * 9. If you're a writer, spend your time inside your abode staring lovingly at your newest book instead of going out into the world where swine flu lurks everywhere. 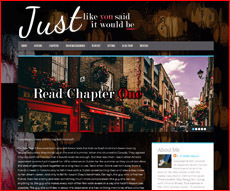 If you're in the middle of penning a new novel, you can just gaze loving at that on your laptop screen. If you're not a writer but are an avid reader, stare at your own favourite book(s) and/or reread them. If you don't enjoy reading quite possibly you already have H1N1—I mean, clearly something's wrong with you, how can you not enjoy reading! * 10. 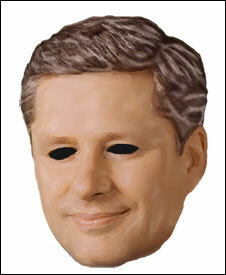 If you absolutely must leave the house to pick up supplies (like the Escape from Bug Island game and Tim Hortons donuts) Buy yourself a Stephen Harper mask this Halloween. People will stay away from you in droves (and therefore, so will the H1N1 germs), especially if you offer to sing Beatles tunes for them. Of course this only works within Canada. Outside our borders limited knowledge about our nation will render this defense useless. Also, in certain ridings, particularly those with a decidedly leftwing bent, people may feel compelled to throw rotting fruit and other assorted items at you but don't worry, they still won't want to get close and will be tossing from a distance, leaving you untainted by the swine flu microbe. In the United States, a possible substitute option is a Sarah Palin mask.